This report first appeared at glorialariva4president.com on October 8, 2016. Banks is on the ballot as the U.S. Vice-Presidential candidate for the Peace and Freedom Party in California, and in Iowa, New Mexico and Colorado for the Party for Socialism and Liberation. 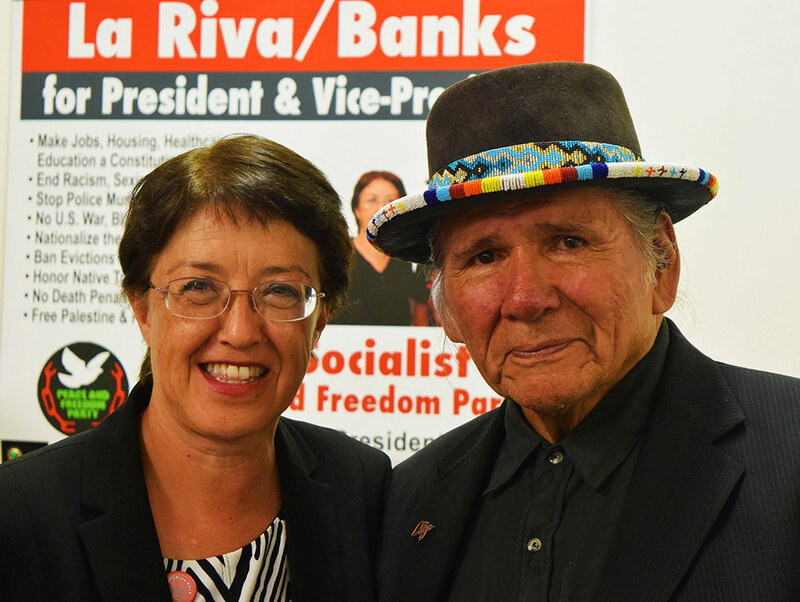 Dennis Banks, co-founder of the American Indian Movement and Vice-Presidential candidate recently visited California to promote the campaign and speak out in solidarity with Native and working-class struggles. On Sept. 30, Banks spoke along with La Riva to a large and enthusiastic crowd of 100 supporters at the San Francisco campaign headquarters, about his lifelong struggle against the racism directed against Native people in the U.S. He spoke plainly but with great conviction, power and humor. In particular, he shared his experience of the disgusting programs forcibly taking Native American children from their families and raising them in an environment divorced from their culture. The schools’ objective, akin to genocide, was to prohibit their language, spirituality and community, often using brutality. Videos of Banks and La Riva speaking at the forum can be viewed here and here, respectively. Following the SF kickoff event Banks, La Riva and their supporters went on to reach thousands of people across the state. They went to San Quentin prison, which houses 730 male inmates on death row, more than any other U.S. prison, and is the largest death-row population in the western hemisphere. There they held a press conference urging people to vote Yes on Prop. 62 to abolish the death penalty and No on Prop. 66, which would speed up executions. While at the prison, the candidates met with family members of prisoners. 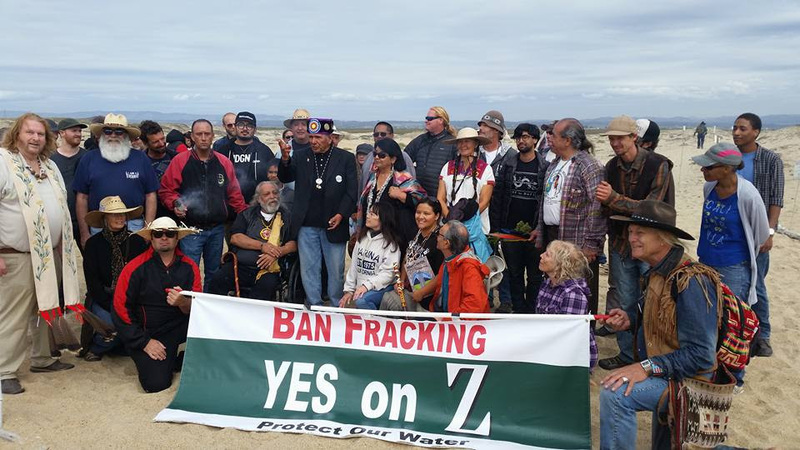 Dennis Banks went with the people of Monterey County to protest the oil companies who are destroying the primary water supply for millions of people in California by fracking and injecting millions of gallons of chemicals into the ground. The campaign expressed support for Monterey County’s Measure Z, the only law up for a vote in the nation this November which would ban fracking. They spoke to more than 90 supporters at a campaign event at Sacramento State University, and at Ukiah’s annual Indian Fry Bread Contest Festival.The candidates did interviews with numerous media outlets including the SF Chronicle Editorial Board and an hour long feature on KPFA’s Flashpoints. PSL vice-presidential candidate Eugene Puryear, who is on the ballot with La Riva in New Jersey, Washington state and Louisiana, is now on an eastern tour. You can follow the PSL campaign on-line and volunteer by going to GloriaLaRiva4President.com.